Learn how to make kimchi with this simple recipe so you can enjoy this popular Korean delicacy at home any time! When I think of Korean food, Kimchi is the first thing that comes to mind. This fermented or pickled, spicy napa cabbage and daikon radish is not only popular in Korea but is now also well loved in the Philippines. And as the demand for English schools in the Philippines for Koreans continues to grow, so are the Korean restaurants and food shops. But they are not only for the Koreans who come to the Philippines but mostly for the locals who have so much fallen in love, not only with Korean telenovelas but with the Korean food as well. The person who first introduced Korean food to me is no other than Sharon, my best friend who is like a sister to me. We’ve known each other since college days but really became the best of friends after we graduated and started working for the same company in Manila. We were also housemates then, well actually on and off. After I left my first job, I had to move away to live near where my new job is. Truth is, I cannot count how many times I’ve moved in 5 years I was in Manila and sometimes in between flats, I would crash at Sharon’s place. Unlike with other food, it was not love at first bite with me and kimchi. I cannot say now why exactly, maybe it was too pungent or too spicy for me, well at least at that time. But Sharon just loves it! She came to know about Korean food because she became friends with a Korean family she met on her next job. That’s how she also learned how to make authentic Kimchi. Sharon didn’t give up on trying to convert me and she succeeded. The next time was not so bad and then after a while I started to crave for it and now I simply love it! So much that, now that I am in Germany where Korean food is not (yet) so trendy, I just had to learn to make my own Kimchi and I’ve been doing so for years. Kimchi is said to be good for your tummy and considered to be a probiotic food. In an article I read, it says kimchi is rich in vitamins A and C, and due to its fermentation process is also rich in beneficial gut-boosting lactobacilli bacteria. So there you go…make it, eat it and have a happy healthy tummy. Learn how to make your own kimchi with this simple recipe so you can enjoy this popular Korean delicacy at home any time! 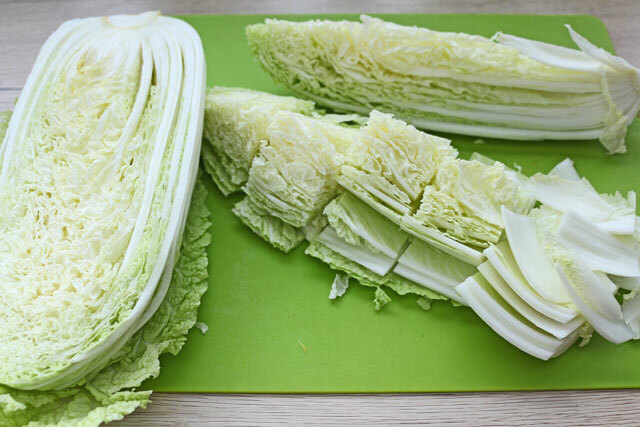 Wash and cut the napa cabbage first, lengthwise into 4, removing the core and then into bite-size pieces. Soak the pieces of cabbage in a bowl of cold water then sprinkle salt. Place a small plate as a weight on top so that all pieces are completely submerged. Let it soak in the brine for at least 1 1/2 hours, turning every 30 minutes. Then drain and rinse thoroughly. Meanwhile, prepare the porridge: In a saucepan, combine 1/4 cup sweet rice flour, 1 1/2 cup water and sugar and mix it well. Bring to a boil over medium heat and continue to cook while stirring constantly until becomes thick and translucent, about 5-7 minutes. Remove from heat and let it cool down before using. Prepare the kimchi paste by putting the ginger, onion, garlic and fish sauce in a blender or mixer and pulse until texture becomes smooth. Transfer this in a big bowl then add the porridge and chili powder. Mix until well combined. Add the sauce to the drained cabbage, daikon radish and onion leeks and mix well. Kimchi may be eaten fresh after making or can be fermented. 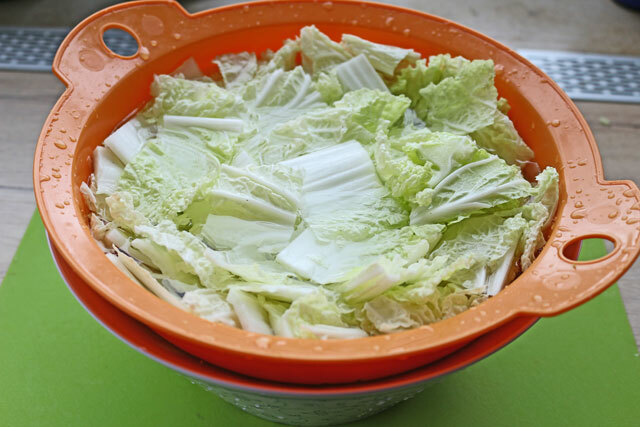 To ferment, put the kimchi into an air-tight sealed plastic container or glass jar. If using jars, leave some space on top as it tends to rise while fermenting. Place jar in a dark and preferably coldest part of the house. Leave it there for 3-5 days. On the 3rd day open the lid of the jar and if you see some bubbles with lots of liquids, or maybe sour smells, it means it’s already being fermented. Transfer the jar to the fridge to slow the fermentation and this can be eaten or stored for months. I just opened my jar of kimchi for the first time after 5 days. I thought it’s gonna be salty because of the fish sauce content but it’s not! This is so much better than a store bought kimchi! I just noticed that the napa cabbage is a bit over however it doesn’t bother me at all. Had this with homemade seafood laksa! Thanks for the wonderful recipe! Thank you! I will try this tomorrow and update you after 5 days. I love kimchi especially on a cold weather. I bought all the recipes I needed to make this except for daikon. I went to Asian shop and it’s not available. My question is, can i omit the daikon? I am located in Australia. Please help.